Over the years, the Red Bank Rotary Club has worked to benefit a diversified number of local charitable organizations and people in need, provide scholarships to graduating high school seniors, and further support the youth of our community through educational and leadership programs. The Red Bank Rotary Club established the Red Bank Rotary Foundation, Inc. in order to raise the funds to support these endeavors. Two of our major fundraising activities that support the mission of the foundation are our annual Food & Wine Tasting event, currently in our 18th year and our Annual Golf Tournament, currently in our 45th year. 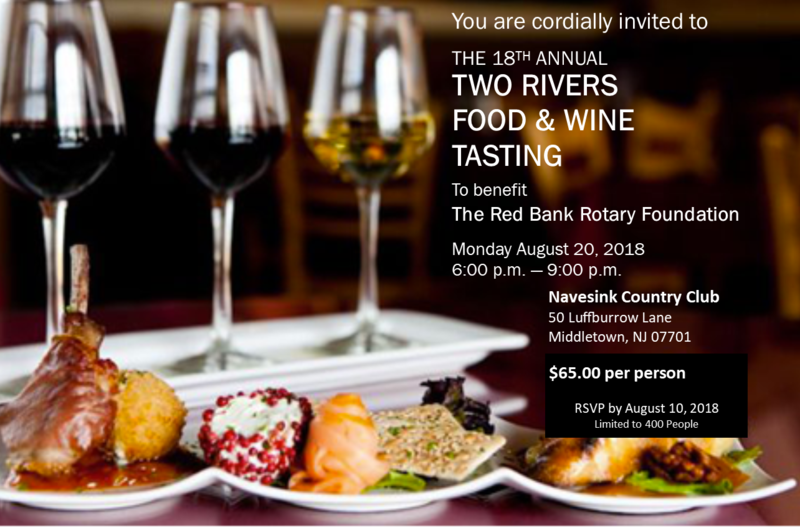 The recipient of this years Two Rivers Food and Wine Tasting Event is the Red Bank Rotary Foundation. Please come out and join us for an evening, sampling some of the best culinary creations and libations the area has to offer. The event will showcase over 30 of the areas best eateries and liquor vendors. Thank you for your continued support! This year's recipient of the proceeds will be The Red Bank Rotary Foundation, a 501C(3) organization whose mission is to advance world understanding, goodwill, and peace through the improvement of health, the support of education, and the alleviation of poverty. The Red Bank Rotary Foundation helps fund humanitarian activities, from local service projects to global initiatives.